If I tell people that we have Victorian family photographs in the ARK, many imagine they know what to expect: stiff collars, stiff backs, stiff upper-lips and stiff poses. Whilst there are indeed photographs in our archives that show Victorians staring firmly at the camera or looking as though they would rather be anywhere but in front of a camera; we are also lucky enough to have some wonderful 19th and early 20th century photos that gleefully disregard their period’s reputation for dour frowns and rigid stances. One such collection is Mr. J.R.J. Clark’s photograph album, containing pictures taken between 1899 and 1900, which has recently been catalogued and digitised thanks to our Heritage Lottery funding. To highlight the work done during the digitisation process of the album, a small exhibition of images from the album has been put together in Kirkby Library. Mr. Clark and his young family lived in Huyton during this period and were clearly a wealthy family. Mr. Clark’s father had been the proprietor of the Lancashire Gazette newspaper and his son, it seems, had trained and worked in law before retiring from the profession at a relatively young age. As our photograph album demonstrates, Mr. Clark used much of his free time to take holidays, enjoy sporting and leisure activities, and pursue an interest in photography. It should be noted that at least some of the pictures are likely to have been taken by other photographers, particularly as Mr. Clark features in some of the images. 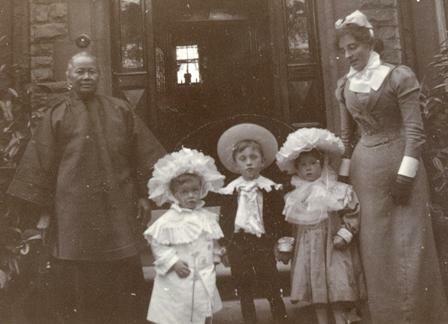 This photograph shows three children with two adults who we assume to be household servants. Mr. Clark’s album unfortunately provides no information as to who they were or what their household roles were. Mr. Clark’s photographs are all exterior shots (where the light, of course, was better) and so all of the images of his Huyton home are outside and usually in the garden. Judging by the fruit and vegetables growing in pots – not to mention the types of clothing people are wearing – these garden photos were taken on warm spring or summer days. As well as family members and friends, household servants weren’t safe from Mr. Clark’s roving camera. Amongst the photographs in the album, there are shots of servants on their own and some where they are shown alongside family members, especially the children. The handwritten captions within the album are unfortunately very erratic, with very few details provided beyond the odd date and location, so we cannot easily identify all of the individuals in the pictures, including the servants and their specific roles. 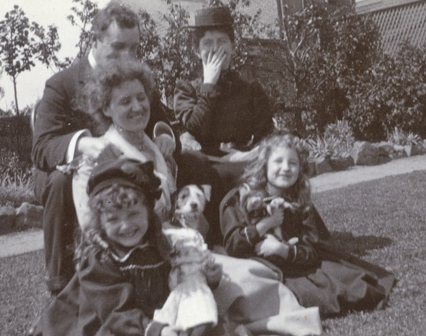 Holidays, both overseas and in the UK, were clearly something of a regular occurrence for the Clark family. The majority of the photographs have been taken whilst on holiday although, as mentioned above, it isn’t always easy to identify locations because most of the pictures don’t have captions. Confirmed locations for holidays include: the Isle of Man; South Devon (Dartmouth, Dawlish, Teignmouth and Exeter were all photographed); York; Fountains Abbey, Ripon; and Paris. Holiday photography provided Mr. Clark (and any other unidentified photographers) with the opportunity to try their hand at landscape images and many of these are very interesting as compositions in their own right and for the wealth of historical information they convey. Despite this, however, the camera’s gaze is still normally focussed on the family and friends’ enjoyment of their time together and the varied activities they involved themselves in. An enthusiasm for sport and other leisure activities, including hunting, is evident from Mr. Clark’s photographs. There are pictures that have been taken of friends and family taking part in sports and images of sporting events, such as show jumping and cricket matches at Aigburth Cricket Club, Liverpool (including a match between Liverpool and District and an Australian team). In other pictures, people pose with golf clubs or croquet mallets, and there is a whole series of photos of people with their hunting guns. One of the other notable things about many of the photographs is their spontaneity and creativity. 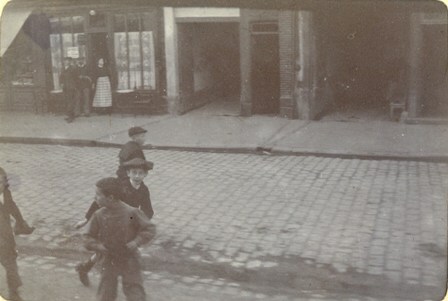 The photographer[s] tried to capture events and moments as they saw them, often resulting in some dynamic and impressive images, such as the photo (right) of children running along a street in Paris. Experimentation is also evident in some of the photographs. 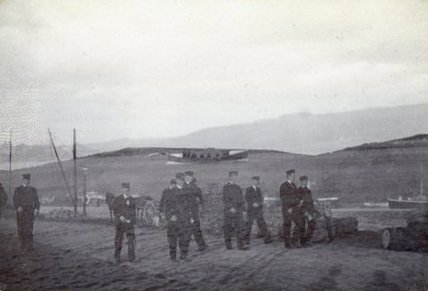 In particular, there is a photograph (below) that is a double-exposed image of Norwegian naval cadets in Dartmouth combined with a picture of a lifeboat in Teignmouth. 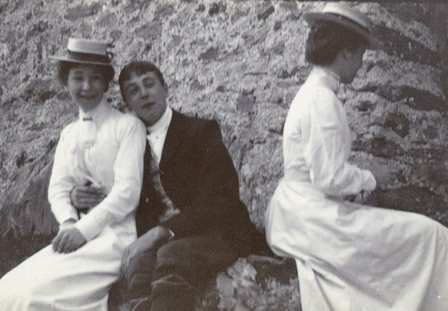 The people in almost all the images in Mr. Clark’s photograph album always seem to be enjoying themselves, often laughing at some unknown joke or antic. Perhaps Mr. Clark, or whoever else was taking the picture, has said something to make everyone laugh or pulled a funny face. Whilst we will never know, I believe that seeing faces from the past showing their enjoyment of their environments and each others company is somehow more powerful and resonant than a formal photograph taken in a studio. It reminds us that whilst our surroundings, haircuts and clothes may have changed, when we’re snapping pictures of family, friends and holidays on our smart phones and digital cameras, we’re not really all that different from the people taking photographs over 100 years ago. The exhibition of images from Mr. Clark’s photograph album is currently on display at Kirkby Library during its normal opening hours.